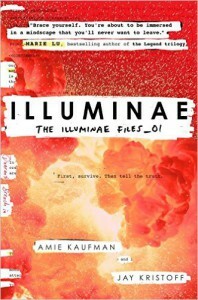 There are just so many reviews for Illuminae so I don’t have anything too revelatory to say, but the true reason for my enjoying it so much this time, is that while reading it, mostly on and off, I listened to the AUDIOBOOK. I think this is almost required for at least one of your experiences with this amazing book (as well as Gemina and Obsidio; I have the audiobooks lined up for those too). The format of all the different kinds of writing that come in the hefty books that are the Illuminae Files, lend themselves so well to audio and the story just comes alive. The different voices of the cast separate the multiple ‘files’ and it makes the whole thing a living, breathing set of documents, rather than even a book. Aidan, Ezra, and Kady’s voices stick with you and make this whole journey and experience something completely transcendent. While Jay and Amie didn’t write this with audio in mind, they unwittingly created both a written and aural masterpiece.